In doing so, the duo raised $20,000 for Boston's Boys and Girls Club. Julian Edelman is fresh off an impressive Super Bowl 53 performance, where he led all receivers with 10 catches and 141 yards helping the Patriots to their sixth title since 2002. While known for making impressive catches and being Tom Brady's go-to man, the Super Bowl 53 MVP also known for his large beard, which is visible even with a helmet on. 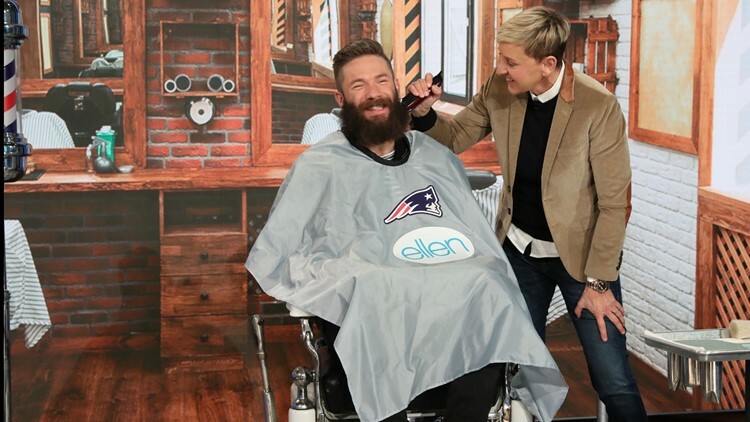 Friday, Edelman let Ellen shave his beard off to raise $10,000 for Boston's Boys and Girls Club. Edelman is adding $10,000 more out of his pocket. He might need to see a barber for a little cleanup, but overall a solid effort from Ellen.